I never was much of a rosé drinker until I went to Gascony and Kate Hill showed me the way. Nowadays it’s my go-to wine of choice for a first drink on a warm summer evening. As such, I was very grateful to receive two bottles of Mirabeau Rosé from Provence, a region I generally favour for rosé as the style tends to be dry and crisp (I can’t stand that sweet stuff). These two bottles did not disappoint. Mirabeau Classic Rosé: A vibrant pink, classic Provence rosé whose generous fruit charms the senses immediately with a heady mixture of wild strawberry aromatics, red cherry and raspberry flavours. Surprisingly elegant and balanced on the palate, the Classic offers a delicious fresh acidity combining with the generosity of fruit, leaving a sumptuous lingering finish. 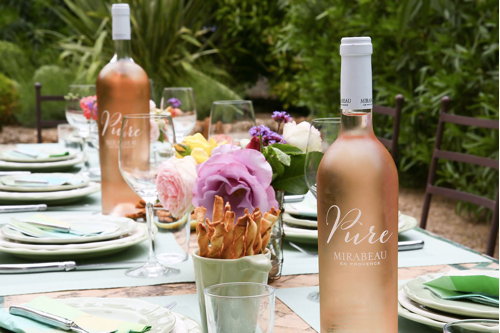 Mirabeau Pure Rosé: Strawberry notes appear first, closely followed by raspberries and white cherries, before the merest whisper of that most elegant of fruits, rhubarb. The acidity is crisp and integrated and the fruit provides an element of textural fruitiness that enables this wine to be drunk as an aperitif as well as with food. The Pure was my favourite of the two – it seemed to have a little more going on and was particularly enjoyable on its own sans food. Both bottles were delicious, very easy drinking. I will definitely be returning to them again for future summer barbecues to come. Mirabeau is available in Waitrose, online and in independent wine retailers and more than 40 markets around the world. You can follow Mirabeau Wine on Twitter, Instagram, Facebook and YouTube. Yes! rosé all the time!! !